Come and take a step back in time with me at the 2015 Indie Romance Convention (IRC). 2015 IRC is offering you a location that no other romance convention has ever been before. We are going to one of the most secluded romantic places in the US, The Grand Hotel. If you love romance you know the movie “Somewhere in Time” was filmed right in the Grand Hotel on Mackinac Island. As an author this might be your once in a life time chance to come and be in a unique setting that might inspire your next bestseller or a chance as a reader to go on a carriage ride or a walk by the lake with your favorite author or other reader friends. There will be ballroom dancing with live music and lots more fun and learning with the authors, so don’t miss this opportunity to join in on the fun. Fun Fact: Mackinac Island is in the top 5 in National Geographic Traveler's Top 20 Worlds Best Islands. Do not miss this incredibly beautiful venue, it’s truly romance inspired! In 2015, IRC will be open to Indie and Small press authors so now is your chance to meet your favorite authors and grab a signed copy of your favorite book. Dates for the Authors and Aspiring Authors are October 13 – 18, 2015. Dates for Readers are 15th – 18th and you get to enjoy lunch with one of the attending authors. There is also a Readers pass for just the Saturday. Click here for your IRC tickets and special deal at The Grand Hotel. On Thursday, January 29th, the Charles M. Schulz Museum is hosting a gratitude reception to thank people in Sonoma County’s literary world for the richness they bring to the community. I am thrilled to be invited and it will be a fun set against the backdrop of the Peanuts in Wonderland exhibition which celebrates the 150th Anniversary of Alice’s Adventures in Wonderland. To find out more about the Peanuts in Wonderland exhibit, click here. 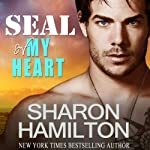 I am celebrating .99c SEAL Friday with… you guessed it….my SEAL ebooks for just .99c! Click on the links below to snap up your copy today. Audiobooks are also available on all books at Audible and iTunes so why not team the ebook and audiobook together with Whispersync?! Redwood Writers Fiction Book Club is collaborating with Copperfield's Books in Santa Rosa, CA to offer a monthly book club and Seal of My Heart is the first book to be reviewed in 2015 on January 27. The Book Club features fiction published by Redwood Writers and is dubbed “Journey Through the Genres” with different fiction genres explored each month. The group meets the last Tuesday of each month. If you don't already own Seal of My Heart, books will be on sale at Copperfield's and attendees are encouraged to read it before the Book Club. I will attend the meeting to respond to comments and questions and the group will be facilitated. RSVP is requested – click here to RSVP. I am going to join the A-Z Blog Challenge this year in April 2015. It means I will take a new letter evvery day and post something on my blog. There will be links to other great blogs as well. Idea is to create a community of new followers, people who are either enthusiasts or readers from other walks of life. In preparation to this, I am joining the First Wednesday blog hop, so every first Wednesday of the month, I'll post another link here. You can not only follow my blogs for that day, but some 200 others. I am SO excited to be one of the Featured Authors at the 5th annual Arizona Dreamin' on May 29-31, 2015! This reader-focused weekend is always a blast -and it's CHEAP! SPEED-MEET 27 authors of VARIOUS GENRES of romance ! Attend 8 “BOOK CLUBS” – 10 readers with 1 author in 30-minute sessions ! LUNCH with individual authors ! DINNER with the author of your choice! FREE ” Dreamin' Dollars” auction ! “MAN OF OUR DREAMS” cover model competition ! RAFFLE BASKETS – 100% of the proceeds go to charity ! More FUN than can be described. True story . Hotel rates are just $95 for a SUITE, and include a FULL breakfast for everyone! Hands down, the best deal around. Sharon Hamilton now on Pinterest! I did it, I joined this pinterest thing. I'm not entirely sure how it works yet, but my assistants are helping me learn. If you have any tips for me, leave them in the comments, and be sure to follow my pin boards! Follow Sharon Hamilton Blog on Bloglovin! With multiple releases, Facebook parties, conventions, and contests galore, this summer has been very, very busy! Because of the craziness, the August Giveaway will be nice and simple! 1 Subscriber/Follower will win a $100 Amazon Gift Card! The main requirement to enter the contest is to be a newsletter subscriber. Following this blog, liking facebook page, and other entries are all extra, and very much appreciated. Enter via the Rafflecopter below. The Winner will be announced in the Newsletter, not posted to the blog, so open those newsletters for winner announcements, new releases, events, and more contests to come! The contest will run through midnight August 31.